Iaido is the art of drawing the Japanese sword. Sound simple? Think again . . .
. . . think back to the days of the samurai. Two samurai are about to duel. Neither has drawn their sword. In a flash, blades are drawn, a cut is delivered and one samurai stands victorious. To draw one’s blade and cut in a single motion requires intense training and focus. This was the beginning of Iaido. Today, Iaido is practiced by men, women and children worldwide. It is a non-contact martial art, with all cuts being delivered to an imagined opponent. 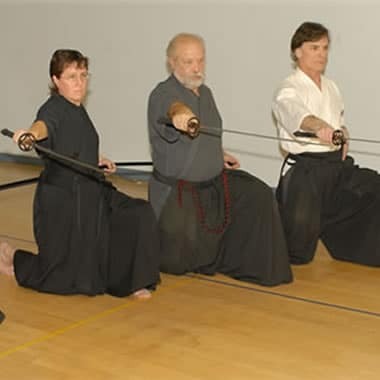 Iaido helps develop and maintain your mental focus, physical balance, strength and flexibility. As martial arts go, it is similar in many ways to Tai Chi and is performed at a slow, determined pace. Beginners in Iaido will be provided with a wooden sword to practice with, although if you want to train seriously, a specially-designed Iaido sword and uniform will be in your future. The Niagara Kendo Club’s Iaido practices are held at the Welland Martial Arts Centre, 40 Division St., Welland. Class times are Friday evenings, 6:00 ~ 7:15 p.m. The instructor is Sensei Ron Mattie, 4th Dan. If you are interested in Iaido, please contact us.